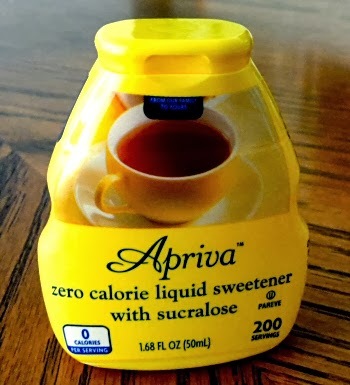 Although I normally use Sweetzfree as my all-purpose sweetener, I decided to give Kroger's Apriva liquid a try. Because it can't be accurately measured, it's not really suitable for cooking and baking. However, I can use it to sweeten my coffee. Instead of measuring by the drop, you squirt it into your beverage. The label says that a squirt is equal to a teaspoon of sugar. I have no idea how accurate my squirts were but I found that I needed to use a lot less than I thought I would. I like my coffee VERY sweet and I usually put in 5-6 drops of Sweetzfree, which is supposedly the equivalent of nearly 1/4 cup of sugar! Obviously that can't be right so I think that Sweetzfree's conversion chart is off quite a bit. Anyway, I only needed about 3 squirts of Apriva per mug of coffee or the equivalent of about 3 teaspoons of sugar. That seems a lot more reasonable than 1/4 cup worth of Sweetzfree, doesn't it? It could be my imagination but the sweetness seemed different than Sweetzfree somehow. I'm not sure if it's a flavor thing or just the kind of sweetness. Maybe I was tasting the preservatives they put in Apriva. It tasted fine, just slightly different. Walmart used to sell a similar product called Sucralose To Go but they've recently stopped selling it in favor of the Skinny Girl brand of sweeteners. I looked at those yesterday and wasn't impressed with the choices. They're expensive and they don't have a sucralose version; only monk fruit, stevia and agave. I did notice recently that HEB has Sucralose To Go but I can get Kroger's version cheaper with my senior discount. Kroger's is $2.99 so I paid $2.69 for it. I just went to the Sucralose To Go site and they're still listing Walmart as the only place to buy it. I really did see it at HEB about a week or two ago so I guess they just need to update their site since you can't buy it at Walmart any longer and it's obviously available elsewhere. I found the Sucralose To Go and the Stevia To Go at Walmart when it first came out. Mixe them together 50:50 and use it in coffee and tea. Have to shop two Walmarts for this. Can't find the Stevia now and the other is running low. Hopefully you'll be able to find it elsewhere now that Walmart doesn't carry it. Check your local grocery stores. They just might have it or have their own version.